« A Supreme Court Reporter: What Are Some Of The Secret Ingredients? Shorthand and stenography have gone high tech, and today’s court reporters are digitally savvy professionals that take advantage of the latest innovations in court reporting technology. From realtime court reporting that delivers speech-to-text directly to the laptops of attorneys to video conferencing, Wisconsin court reporters from Brown & Jones have the latest tools and the know-how to put them to good use. 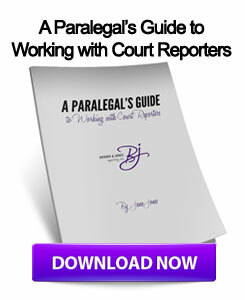 One of the most important revolutions in the court reporting industry is realtime court reporting. This technology takes the court reporter’s output from the steno machine and translates it into text as the court reporter keys it in – in real time. The steno machine is connected to a computer equipped with realtime court reporting software. Depending on the software and the needs of the client, the realtime feed can be transmitted to courtroom monitors, to individual computers or laptops, or securely over the Internet to remote attorneys. With realtime court reporting, Wisconsin court reporters’ transcripts can be transmitted to partners located virtually anywhere in the world as the words are spoken. In addition to being able to see the testimony in a text-based format, attorneys can immediately begin working with the court reporter’s feed. For example, they can add notes, search for keywords, copy and paste testimony, and more without having to wait for the court reporter to issue a final transcript. Wisconsin court reporters often participate in video conferencing as well. Video conferencing makes it possible to interview out-of-area witnesses remotely, participate in remote depositions, and hold meetings without the expense or hassles of travel. Whether you need a court reporter present or simply want a convenient way to meet with partners, video conferencing is a convenient, cost-effective choice that delivers the benefits of face-to-face meetings without the hassles. For example, imagine a Wisconsin attorney who needs to interview an expert witness located in Florida. Instead of the attorney flying to Florida or paying for the witness to fly to and stay overnight in Wisconsin, video conferencing suites in each location can be booked. The video conferencing facilities handle the technical details, and all the two parties need to do is show up and interact with one another. Realtime court reporting and video conferencing technologies are changing the industry – for the better. Experience the difference with Brown & Jones in Wisconsin. This entry was posted on Wednesday, April 25th, 2012 at 3:28 pm	and is filed under All Posts, Court Reporting, Technology. You can follow any responses to this entry through the RSS 2.0 feed. You can skip to the end and leave a response. Pinging is currently not allowed. Court reporters are irreplaceable and have astounding skills!